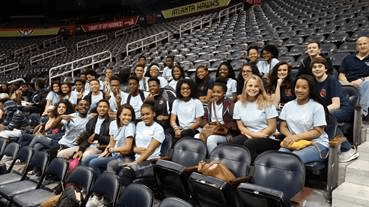 Hillgrove High School’s FBLA members traveled to Atlanta to attend the FBLA Sports Marketing Competition with the Atlanta Hawks. While there, member’s competed in various sports marketing and skills competitions. Hillgrove did an outstanding job and placed 1st place in the skills competition and 1st place in the concert promotion competition. By winning 1st place, the Atlanta Hawks awarded the chapter with $500 and various members we given Hawks paraphernalia and tickets for the Hawks vs Cleveland Cavaliers game. After competing, members were treated to a splendid game by the Atlanta Hawks as they beat the Denver Nuggets.